Clients often discuss with us what money can provide for themselves and their family. We also talk about how wealth can fuel dysfunction for those who haven’;t earned their wealth. To explore these concepts deeper, we recommend reading Kids, Wealth and Consequences. The book provides an iterative chapter-by-chapter process that leads parents to a deeper understanding of themselves and what their choices and actions mean for their children. Kids, Wealth and Consequences describes how parents can impart to their children the skills they need for successful, happy lives. Morris and Pearl help parents evaluate how their choices in spending, financial management, and estate planning affect the wealth and legacy they will leave behind. The authors offer ways for parents to discuss money with their children, teaching them how to spend, invest and manage it responsibly. Parents also learn how to avoid the unintended consequences of inherited wealth, such as uncontrolled spending, lack of direction, lack of self-esteem and dependency. In addition, the authors address the key financial, intellectual and emotional issues of wealth. The book tackles such issues as investing and estate planning as well as such issues as values, family and communication in a way that underscores the interplay among all three areas. Morris and Pearl cite experts to illustrate key points and also include insights into how recent economic difficulties have affected decision making. 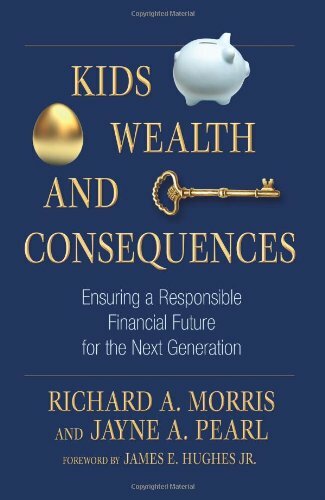 Disclaimer: Assante does not promote Kids, Wealth and Consequences by Richard A. Morris & Jayne A Pearl and its views shall not be used for product endorsement purposes.